I love finding a good deal on a plain shirt. I keep my eyes open at Wal-Mart and Target, especially, for those plain long or short-sleeved tees at the end of the season. I'll grab a bunch of them up for $1-$2 each. Then, let the fun begin! I made this shirt for my three-year-old's birthday. 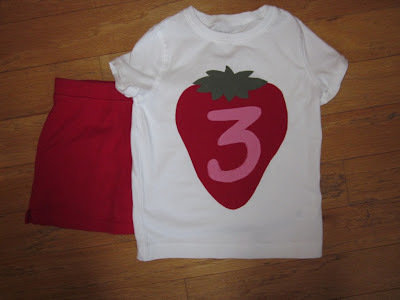 We had a little bit of a strawberry theme going on. I just used old knit scraps from T-shirts in my scrap pile for the applique. I love using knit because it doesn't fray. 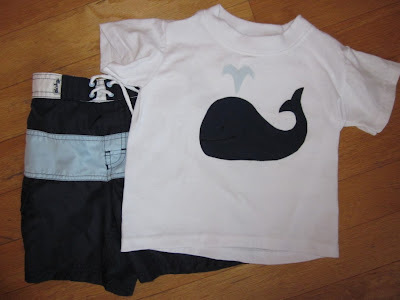 I found these swim trunks for my nephew and knew I had to make him a whale shirt to match. I used scrap fabrics here, too, and found a basic whale template online using google images. I did a variety pack for a good friend's baby shower gift. I decided to try freezer paper stenciling for the first time. It was not as hard as I thought it would be. I used Dana's tutorial and it was actually pretty fun to do. In case you're wondering, my friend loves George Washington, fall, and has a pet great Dane. I'm all about personalizing these things. 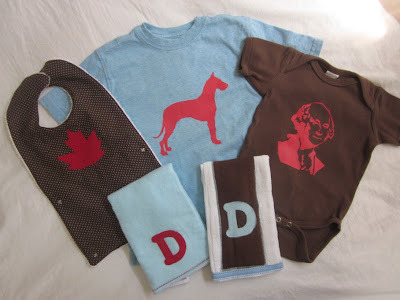 If you're thinking about applique or stenciling, you should go for it! It is easy, takes a relatively short time, and it makes clothing unique and fun. It is also great for covering up stains on shirts you already have - no need to throw those away! Good luck on prettying up all your T-shirts.